Halloween Countdown Special! 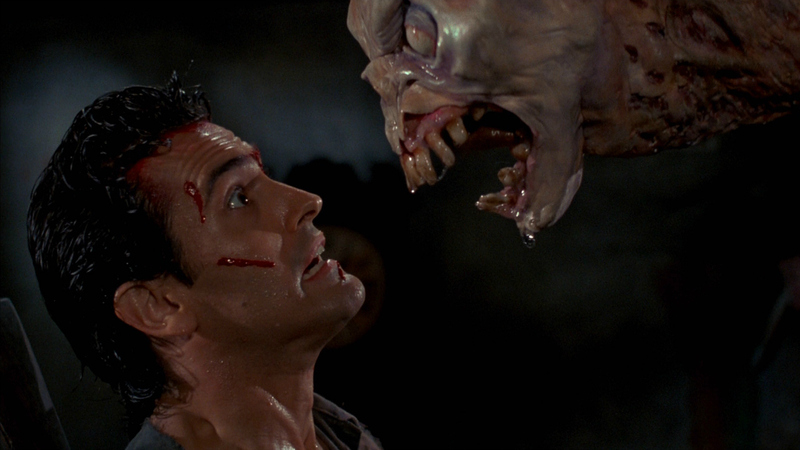 #06 – EVIL DEAD II! – Show Me The Movies! Halloween Countdown Special! #06 – EVIL DEAD II! We’re really getting down to the cult classics in our Halloween countdown special and in at number 6 is a movie that is part-remake and part re-telling of the first film in the series. Some regard EVIL DEAD II as a direct sequel to the 1981 original THE EVIL DEAD but the story goes that after a rights issue with the first movie director Sam Raimi set out to re-tell the story but with more humour, frenetic action and spiraling camera-gymnastics. And boy oh boy oh boy does Raimi deliver with a film that is undoubtedly one of the finest horror comedies ever made and in Bruce Campbell’s hero Ash a cult horror icon was (re)born. He is an everyday ordinary supermarket attendant who suddenly finds himself having to fend off evil spirits, zombies and even his own possessed hand. The film is hilarious, shocking, repulsive, spooky and always one hundred percent “Groovy”! One scene alone just won’t cut it! The gore is glorious with decapitations, mutilated bodies, a hand cut off, bleeding demons, and simply gallons of blood spread all over the place! Previous Previous post: Is THE RAID Director Gareth Evans Set to Helm DEATHSTROKE Movie? Next Next post: New JUSTICE LEAGUE Trailer Unleashes The Big Bad Guy!